What a difference six years makes. 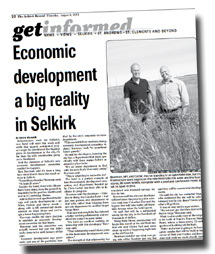 On February 23, 2007 I proposed the terms of reference for a City of Selkirk Sustainable Development Committee. Back then, council was struggling to manage the little bit of development interest we were receiving at the time. I say struggle, but I really should say strangle. The city was effectively strangling the development we had at the time because of inefficient administrative processes, and worse yet – a dysfunctional political situation. The intention of this committee was two fold. First, it was intended to introduce the idea of sustainability into our growth conversations. The majority of council at that time was jumping at any growth they could create, never stopping to ask if that growth was good for the city, economically, socially and environmentally. Growth for the sake of growth is stupid. Looking at the last hundred years of urban growth in North Americayou can see that cities that consider the impacts of growth and practice smart growth are the ones that deliver a high quality of life for the current and future generations of residents. It’s the difference between Detroit and Seattle. Sustainable cities have lower crime, low unemployment, higher average family incomes, more cultural and recreational opportunities, better active and mass transit options, higher levels of resident satisfaction and affordable municipal services. This is what council should want for Selkirk, and the proposed committee would have made these considerations a central part of our growth activities. It would have encouraged the type of growth that would make us more sustainable and would have discouraged the type of growth that is driving many North American cities into the ground. The second purpose was to overcome the strangling processes and practices that were limiting Selkirk’s potential. First it would have made economic growth a focus. Too often opportunities were getting lost in the regular business of council and administration. It was being given the same level of importance as parking ticket overturn requests. A separate meeting with a laser focus on economic development would ensure that council could spend uninterrupted, dedicated time considering options and following up on activities. It would have made sustainable economic development a priority. The committee would have also provided a clear point of entry for developers and others looking to do business with the city. At the time, there was no clear sign that said “Open for Business”. Unfortunately, many people interested in doing business would start with the Mayor of the day. If the Mayor liked the proposal then council might hear about it long after the Mayor had directed administration to being negotiations or exploratory discussion. If the Mayor didn’t like the proposal – it was dead. Council would never hear about it and administration wouldn’t be asked to participate. When I proposed the committee that fateful night in February, the majority of council voted against the resolution because David Bell didn’t like the proposal because he wouldn’t be the chair. He wouldn’t have the same power to limit council’s information as all members of council would be at the committee table. As the regularly did, Councillors Rapko, Pruden and Cook voted with him. In my opinion, narrow political interests were put before the needs of the community that night. Fast forward six years later. I again proposed the same terms of reference. With zero debate – council unanimously adopted the committee structure and focus. We appointed Councillor Ken Beerman to chair the committee. Since striking the committee, we reallocated internal resources and created an office of economic development. Since then, under the leadership of Councillor Beerman and the hard work of our new Economic Development office, we have begun cleaning up development files that are years overdue. We have multiple development proposals before us and we are working on new processes that will reduce red-tape while increasing our ability to consider the long-term impacts of development. We are finally spending time talking about what development we should attract. The development conditions we impose are aligned with smart growth principles. And best of all – economic development has become a team sport where each of us bring our experience and knowledge to the table where we can truly participate. This is in no small part due to the leadership of Ken Beerman. Quiet, fiercely determined and a true team player. If the committee was a good idea, Ken as chair was a brilliant decision. The past three years of council have been the most exciting and productive in my 12 years as a councillor. The current council is optimistic, hard working, and most of all visionary. Hold on to your hats Selkirk – I truly believe we are on the edge of something fantastic. This is our time.